Q: In a few days you'll travel to Caracas at the invitation of Venezuelan civil society groups, who met you in Warsaw to discuss the failures of the State's rights and democracy in the South American country. What do you expect from this trip? LW: During Poland's Communist era, when I traveled around the world to meet heads of state, presidents, royalty, no one could believe in the possibility of a peaceful transition in communist countries in a few years' time. And we managed to shed the Communist yoke without bloodshed. I believe that this spirit of freedom, with the same methods, will spread throughout the world. No one has invented a better system than democracy. And that is my message to the people I'll be meeting in Venezuela. I'm very interested in meeting students and NGO members. In Venezuela's case one can not talk about a democratic system administered by the [ruling] power. Venezuela's opposition is weak and divided internally, without powerful arguments with which to confront President Chavez. It needs our support. Q. You tried to visit the country last year, but Caracas informed you that they could not guarantee your safety. In diplomatic terms that meant you were not welcome. Do you think the government will forbid your visit this time? LW: The government explained that it was a security matter. I interpreted it as a lack of goodwill, since the message I would bring to Venezuela would not be convenient to Venezuelan authorities. At that time I said I would again try to visit Venezuela, and I hope this time I'll be able to meet with the Venezuelan youth and don't think that this time the Venezuelan government will put up the same lack of goodwill. Chavez instructed authorities on Tuesday to ensure that Walesa does not enter Venezuela, which is preparing for a Feb. 15 referendum on a proposal to lift term limits for all elected officials. 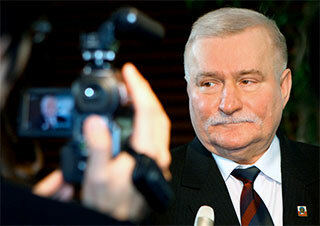 Chavez made the comment after an interviewer suggested that Walesa had received a new invitation. "We have the obligation of making sure Venezuela's dignity is respected. (Walesa) can say that, wherever he feels like beyond Venezuela's borders, but here, within Venezuela, no, no," Chavez insisted. He then instructed chancellor Nicolas Maduro to make sure Walesa does not enter Venezuela. The Constitutional referendum on abolishing presidential term limits is scheduled for Sunday, Feb. 15.